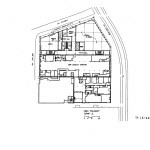 SERA Architects have scheduled a Pre-Application Conference to discuss a potential addition to the New Market Theater building in the Skidmore / Old Town Historic District. 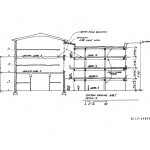 The new four story structure would be primarily used as creative office space, with possible retail space at the ground floor. 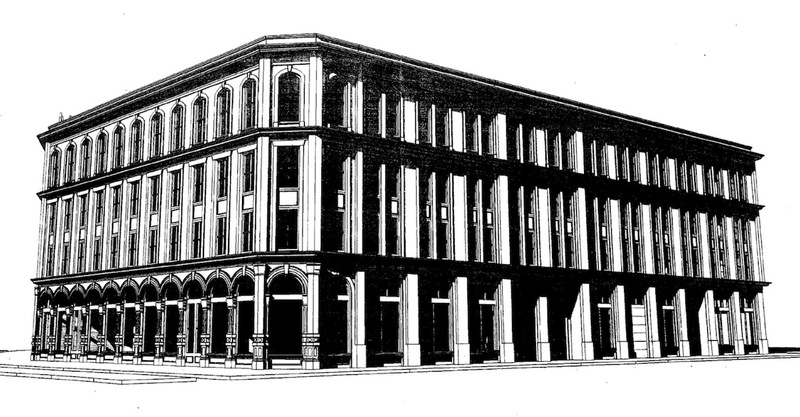 The New Market Theater at 50 SW 2nd Ave was built in 1872. 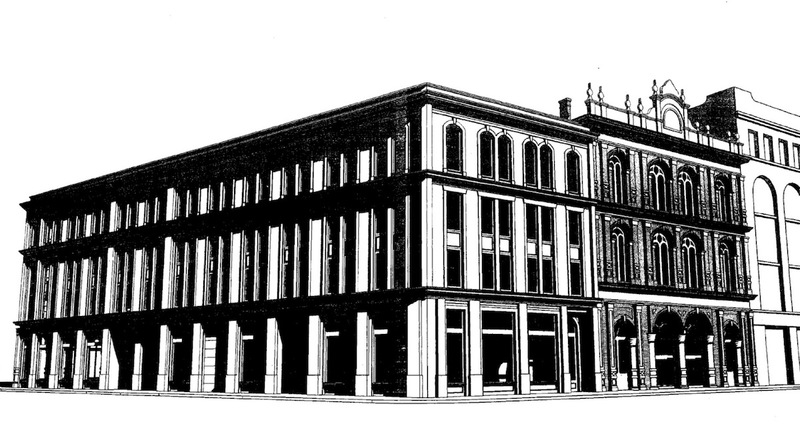 The cast iron building once included a public market, commercial offices and a “lavish 800 seat theater”. Though the interior has been significantly altered over the years, the exterior remains largely intact. Almost as soon as the New Market Theater was completed, construction began on the North Wing which was finished in 1873. The North Wing was demolished in 1956, and all that remains of it today are the cast iron arches that face onto SW 1st Ave. Today the New Market Theater is a Portland Historic Landmark, and a contributing structure in the Skidmore / Old Town Historic District. Multiple facade treatments for the building were submitted to the City for discussion. All incorporate the arches from the 1873 North Wing. 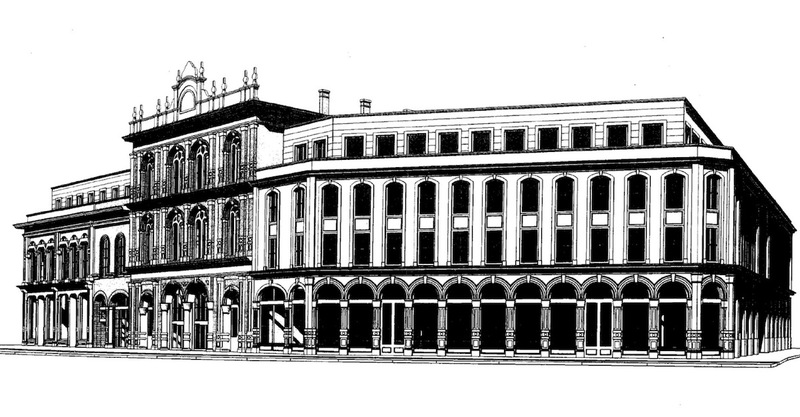 Option A (above) shows the fourth story facade flush with the lower floors. 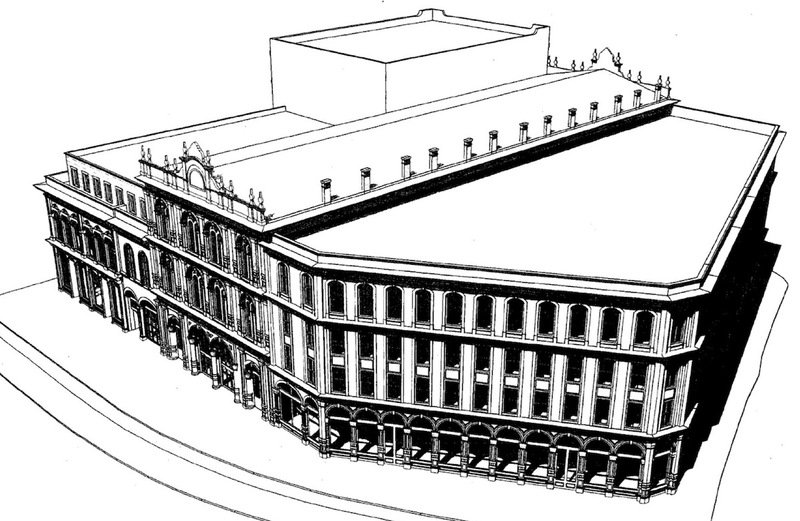 Option B (below) recesses the fourth story, in a move that suggests the massing that existed on the New Market block from the late 19th Century to the mid 20th Century. The Pre-Application Conference [PDF] is scheduled for November 19th 2015 at 8:30 AM. 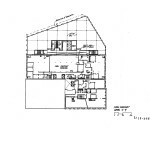 The project will be required to go through a Type III Historic Resource Review, with public hearings before the Historic Landmarks Commission. This entry was posted in New Market Theater addition, Old Town China Town, SERA Architects. Bookmark the permalink. In terms of the proposed architecture the irony is this proposed “conforming” design choice actually obscures the historic structure. A modern more transparent glass neighbor would in fact bring more attention to the New Market Theater building and celebrate it with contrast– a concept Landmarks might want to consider lest we devolve a neighborhood of rich texture into one of parody.